In September we welcomed ten new people onto our environmental apprenticeship scheme. They will spend the next two years learning on-the-job with a local organisation, study at college for a Level 2 Diploma, and get stuck into a variety of specialist training courses. They will meet new friends, gain new skills and have other opportunities along the way – like the chance to be part of our Green Futures youth programme. Most importantly they will learn how to take care of the special landscape here in the Dales. And they can do all of this without having to move away from the place they grew up in. Year after year we’re constantly amazed and surprised by what our apprentices achieve during their time with us and after they leave. For some it is a life-changing experience, with 85% going on to full time employment or further education. Before I applied for my apprenticeship I had taken up a place studying for an art degree at Leeds Beckett University, but after the first semester I realised it wasn’t for me. I didn’t have a career plan and was also keen to avoid a large student loan. I wanted to go home to the Dales to look for something more vocational and practical. I wasn’t aware that opportunities like apprenticeships existed in the environmental conservation sector, so I was excited when I saw the advert in the paper. 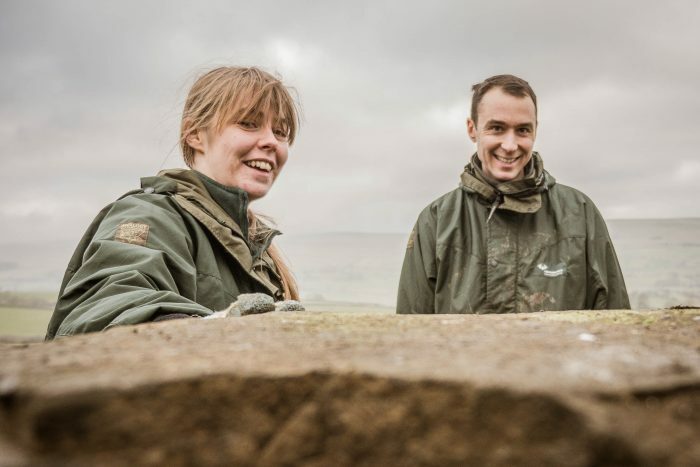 I thought that I would enjoy working outdoors and getting involved in a wide variety of tasks that contribute towards looking after the Yorkshire Dales. Everyone wants to be a Ranger! I was 20 years old at the start of my two year work placement with Yorkshire Dales National Park Authority (YDNPA). I started in 2010, working alongside Rangers to learn the skills and knowledge needed to maintain the rights of way network within the park. I repaired stiles and gates and learnt dry stone walling and habitat conservation skills. It was quite a change from what I had been doing. The support given by my work colleagues was invaluable in getting to where I am today. YDMT organised my Level 2 Diploma in environmental conservation which I completed at Craven College in Skipton. They put me through training courses in chainsaw, brush cutter, Quad Bike, 360 digger, trailer driving and chemical spraying to name a few and gave me support throughout, making sure everything ran smoothly. I enjoyed my apprenticeship because the variety of work provided challenges and I found it to be satisfying and rewarding, knowing that I had contributed towards something positive every day. By the end of my placement, my C.V. had grown quite a lot and the experience I gained led me to a temporary contract as an Access Ranger for YDNPA. I then went on to a seasonal Ranger post in Loch Lomond and the Trossachs National Park, where I worked for a summer as a patrol ranger, keeping an eye on campers and visitors. This was quite an idyllic job, except for some of the anti-social behaviour from campers which we had to deal with. This led me to a part time job for North York Moors National Park Authority where I worked as an Access Ranger and then on to a job at Swinton Estate and Camp Hill Estate at their glamping sites as a maintenance worker. I also worked for a private estate planting trees and controlling invasive plant species, and at the Himalayan Garden putting my chainsaw skills to use and thinning out the woodland for new planting. Now I am an Access Ranger based in Hawes for YDNPA. I was glad to be offered the job, it made it feel like the apprenticeship and years of experience had paid off. They could see that I had done my apprenticeship, gone and worked in two other national parks and in other places and gained experience and saw different ways of doing things. In my current role I plan and execute jobs on Rights of Way, liaising with the local community and landowners. I manage resources like volunteers, machinery, tools, equipment and materials. I’ve carried out large scale projects; engineering surfaces and drains, as well maintenance on stiles and gates and wildlife conservation. I recently completed by level 3 Diploma in Environmental Conservation through Craven College, supported by my employer. I am now involved in training new apprentices joining YDNPA through the Yorkshire Dales Millennium Trust scheme, which I enjoy, as I have been in their shoes! I enjoy the work that I do and I’m grateful to YDMT for offering me the opportunity to get my foot in the door. I don’t think that university and higher education is for everyone, and I wish I had considered alternatives like apprenticeships sooner, perhaps after leaving school. Most young people would have stayed in Leeds where I went to university, because there are fewer options for work in the Dales, which is a shame. So good on YDMT for providing more opportunities and I am glad they continue to do so. I do think the apprenticeship scheme was very valuable in getting me where I am today. And the success of others gaining employment proves this. Josh, Tom and Suzannah – who were all apprentices through the YDMT scheme – have all gone on to work full time for YDNPA. My plans for the future are to continue working for YDNPA and to keep gaining experience; skills and knowledge that will help me progress in my career as a Ranger. So a big thank you to all YDMT’s supporters for making schemes like this happen! YDMT’s environmental apprenticeships are supported by National Lottery players through Stories in Stone which is mainly funded by Heritage Lottery Fund, and Green Futures which is funded by the Big Lottery Fund.